on Planet Earth. First came insects, in the unimaginably distant past. For over 100 million years or more they ruled the skies. But these were mere pioneers of the air. Think of them, in aviation terms, as the flimsy open-cockpit planes of the early 20th Century. Then, several hundred million years ago, huge and often terrifying new life forms, Pterosaurs, or flying dinosaurs, took the ascendancy. These massive creatures had wings of skin, stretched between one enormously elongated finger and their flanks. Around 150 million years ago they were joined by - or, as many scientists say, they began to turn into - a much more aerodynamic, feathered creature. The bird was born. And so the flimsy biplane ceded aerial mastery to nature's many equivalents of the Boeing 767, Concorde, the B52 bomber, the stealth fighter. A huge variety of ancient bird types have come and gone and evolved to give us the 9000 different species we know today. Many scientists are convinced that birds evolved from the dinosaurs. Numerous finds in recent years have seemed to support the hypothesis that birds descended from two-legged, running dinosaurs called theropods. This theory was born with the discovery of a 150-million-year-old fossilised creature in a swamp in Germany in the 1860s. Archaeopteryx was possibly the most controversial prehistoric remain ever dug up. It is the oldest known bird fossil. Most biologists accept it as conclusive proof that dinosaurs sired birds. Archaeopteryx had three toes armed with claws and long, strong legs. Clearly it walked and perched like a bird. Its head had the reptilian feature of jaw bones. Its spine was extended into a bony tail - just like a reptile's. On both sides of the tail bones, clearly visible, were the clinching characteristics of birds - feathers. But not all scientists agree with the birds-from-dinosaurs link. Alan Feduccia, professor of biology at the University of North Carolina, is a noteable doubter. He contends that Archaeopteryx wasn't the ancestor of all birds, but just another of nature's many experiments. He argues that a huge evolution of birds had been going on before[italics] Archaeopteryx, and that they evolved from four-legged forest reptiles. In 1996 Feduccia investigated an intriguing bird that lived about 135 million years ago, just after Archaeopteryx. The bird, Liaoningornis, did not look like a dinosaur bird at all. 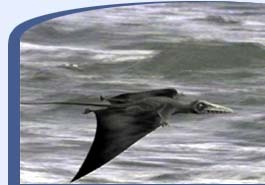 It had a breastbone similar to modern birds, with massive flight muscles that enabled longer flights. It was found alongside fossils of ancient birds not unlike Archaeopteryx. Feduccia believes that birds were very widespread by that date, occupying a variety of habitats. He believes most of them died out with the dinosaurs, about 65 million years ago. The ancestors of all today's birds evolved later, he says, between 65 and 53 million years ago, independently of the dinosaurs. This is the "big bang theory" of birds. Feduccia and his fellow sceptics - it must be stressed they are in the minority - regard any similarity between birds and dinosaurs as an example of convergent evolution, by which two independent groups grow to look alike. However the dinosuar-to-birds theory took another startling turn recently with the discovery of two species of feathered dinosaurs in China, dating from between 145 million and 125 million years ago. "This is the most important dinosaur discovery of this century," said Philip J. Currie of the Royal Tyrrell Museum of Paleontology in Drumheller, Alberta. "The credibility of the dinosaur-to-birds theory takes a gigantic leap ahead with these specimens." While scientists continue to debate exactly where birds came from, nobody denies that their subsequent success in colonising the planet has been immense. Since the catastrophe that wiped out the dinosaurs - now commonly believed to have been a huge meteor - birds have taken total command of the skies. For a time, when the early mammals were still quite small, birds effectively ruled the planet. 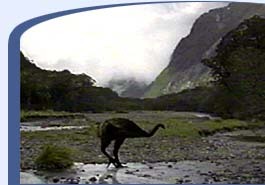 Huge flightless "terror-birds" stalked the land. Mighty vultures cruised the skies. One had a wingspan of over twenty feet - bigger even that that of the Andean Condor, and probably the biggest flying bird that has ever existed. The power of flight gave birds the edge over most other creatures. They could travel futher and wider in search of food, and live where no other creature could go. Millions of years of evolution have adapted each bird species to fit into its own little niche and pre-programmed it to feed, to migrate, to nest and breed in its own particular place and manner. Birds have adapted so well to the demands of and trials set by our planet that Sir David Attenborough believes they may be the most successful creatures on earth, more successful even than insects. At the southern extremity of the world lives the Emperor Penguin, better adapted to the cold than any other animal on earth. Short feathers made up of tiny filaments that trap the air in a continuous layer all around the body enable the adults and chicks to survive some of the coldest conditions on Earth, the Antarctic ice-cap in winter. The champion of the Arctic, in the cold north, is the ivory gull. This beautiful snow-white gull breeds further north than any other bird, and it perfectly adapted to the conditions which defeat most other life forms. It lives here all year-round, even in the dreary winter dark. The bar-headed goose breeds in one of the most desolate places on earth - high up on the Tibetan plateau, deep within the heart of the vast Asian continent. Equally desolate, but much hotter is the vast barren landscape of the Atacama Desert in South America, with not a green leaf in sight. The savage, searing sun heats the grey sand up to temperatures as high as 50C. In this dreadful desert grey gulls live untroubled by predators. But they have to fly hundreds of miles to find food. There are many other examples of birds living on the edge. The oilbird lives in the total blackness of Venezuelan caves. The rufous hummingbird survives and breed at altitudes of 9000ft and at temperatures well below freezing by making a nest of the highest insulate qualities, a network of lichen and spiders web, as good as the finest down. The gouldian finch, one of world's most beautiful birds, requires fire for its food. It feeds mainly on the seeds of one plant - speargrass. It is only after fires - started by accident or by man - have cleared the undergrowth that the birds can reach the seeds on the ground. Another bird that lives on the elemental edge is the Temmincks courser in Africa. It seeks grassland that has just been razed by fire for its nesting habitat. Yet there are practical benefits in such a forbidding terrain. A flush of insects follows the inferno; and the open vistas enable it to see predators. There have been many extinctions as birds edged up evolutionary blind alleys, and as periodic ice ages swept up and down the latitudes. In one prolonged period of cold about 3 million years ago, climate changes may have caused the extinction of a quarter of the existing bird species. But, armed with the beak, one of the most versatile of all nature's feeding implements, birds have colonized the world. It's as if humans had developed a hundred thousand different versions of the knife and fork. High in the New Zealand Alps lives a bird that finds food with a unique beak. In shallow, gravelly streams the wrybill probes for larvae under heavy boulders it couldn't hope to shift. It has the only beak in the entire bird world that's bent to one side (the right). Today the main threat posed to birds comes from man, his destructive tendencies and his manipulation of the environment. The life of birds has changed enormously since man spread widely around the planet, and began to develop and despoil it. Man is the primary force threatening the natural world. Habitat destruction, hunting, introduction of alien species and pollution combine to threaten almost 1000 species of birds world-wide. Perhaps the best known bird extinction is the passenger pigeon, a North American species. It may once have been the commonest bird that has ever lived on earth. There was a population of an estimated two billion birds in colonial days, when huge overflying flocks would darkened the sky. But even these phenomenal numbers could not guarantee the bird's existence. European colonists cut down the beech forests that provided food for the pigeons, and slaughtered the birds for food. The last wild pigeon was shot by a boy in 1900; Martha, the last captive bird, died in Cincinnati Zoo in 1914. Birds living on small islands are highly vulnerable to extinction. Many have become flightless in the absence of natural predators, and when man arrived, with rats, cats and other animals, the birds stand little chance. Over 90% of birds that have become extinct during historical times lived on islands. 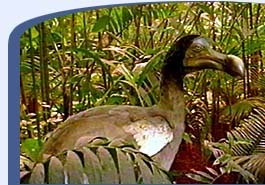 The dodo is the tragic symbol of bird extermination. This large, flightless, turkey-sized pigeon lived on the tropical island of Mauritius. A fruit-eater, it had little reason to move fast or fly. It was easy prey for man the hunter. The sailor Volquard Iversen, shipwrecked on Mauritius for 5 days in 1662, gave the last eye witness account. He wrote: "They were larger than geese but not able to fly. Instead of wings they had small flaps, but they could run very fast." Not fast enough, though, for human hunters, Only fossils and a few preserved specimens remain to remind us of this tragic species. On the islands of New Zealand you can still glimpse what the world would have been like if birds had won the battle with the early mammals and now ruled the earth. These islands, with no endemic mammals, and isolated for so long from man, became a true paradise for birds, many of them flightless. There were twelve species of moas, including the tallest bird that has ever been known, The first human settlers on these islands saw these giants alive, then proceeded to slaughter them. Within 200-300 years most of the moas' habitat was destroyed, and all the moas were hunted to extinction in one of the greatest mass extinctions of birds in man's history. But many extraordinary birds still live only in New Zealand, including the strange, nocturnal kiwi, and the heaviest parrot in the world, the flightless kakapo, which is itself on the brink of extinction. The other effect man is having on birds is the phenoenom of climate change, caused by global warming, believed to be mainly a result of the burning of fossil fuels. One of the likeliest victims is the Bermuda Petrel, surely doomed if the earth gets much warmer. The bird nests in burrows on the side of the cliffs just above the sea-line. But with increasing warming of the earth and the danger of the sea-level rising, these petrels risk being washed out of their burrows. The Bermuda Petrel's history has been one of continuous disasters. In the early 1600s, the birds were hunted and eaten in their thousands by the first sailors and settlers that arrived on Bermuda. The petrels only come to land at night, and the sailors called them "cahow" after their fearsome call. Within 20 years of the islands being settled, the birds were thought to be extinct, and for 300 years they remained a folk memory. 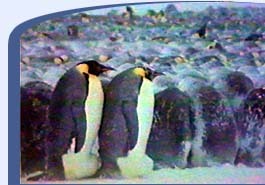 In 1951 about 18 pairs of birds were re-discovered nesting in shallow burrows and rock crevices on tiny offshore islands. Man makes a damaging impact on the natural environment of birds through farming, forestry and building works. There are many casualties: in Britain ornithologists have noted the decline of many once-common birds like the song thrush and the skylark, because of intensivive farming regimes. The British government now publishes an annual index containing certain key bird species; it has accepted the tenet that a fall in bird numbers damages the citizen's "quality of life." Sometimes birds destroy their own habitat. La Perouse Bay on the Hudson Bay in the Canadian Arctic is a traditional breeding ground for the lesser snow goose. After reserves were created to protect the birds, the population grew to such an extent that the birds actually ate themselves out of their own food. La Perouse Bay today is a saline desert - the geese have eaten and destroyed all the natural grasses that used to grow here. But such self destruction is the exception. The birds that survive best tend be those most tolerant of man, or most able to take advantage of him. Birds like the waxwing, which have become a major problem for blueberry and strawberry growers in Florida and other states. Flocks of 500-1000 tiny birds can wipe out a whole blueberry crop within a few days. Some birds, perversely, actually benefit from the pollution from intensive farming. The concentrated fertilisers farmers apply to fields may be good for the crops, but when they are washed out by the rain they contaminate streams and rivers. Rich nutrients cause some aquatic plants and invertebrates to flourish at the expense of the delicate balance of life in the waters. 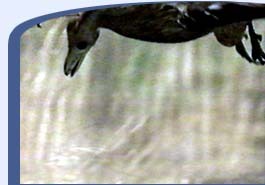 This is bad for many birds, but not the ruddy duck, a small diving duck of North America. It feeds on the small aquatic Chironomid larvae in lake and river sediment. The larvae thrive in agricultural run-off. Ruddy duck feed on the burgeoning larvae and are also doing well. The densely crowded and noisy cityscape would seem to be a highly inhospitable place for birds, unlike anything nature has produced. And yet there are birds which survive and prosper in the city. These are the generalists - able to eat anything and nest anywhere. Black vultures in Sao Paulo city are never more than a flap and a glide from all the fetid rubbish they can eat. These urban scavengers nest on window ledges and roofs of tall skyscrapers. Some spend hours each day basking in front of warm exhausts from air-conditioner units. In Kampala, Uganda, marabou storks are seen on the Sheraton Hotel. 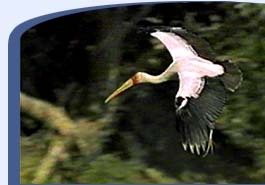 In parts of Africa the white stork now only nests on buildings. In downtown Manhattan, peregrine falcons can be seen hawking down the "canyons" between buildings for small birds. In the black townships of South Africa, red-footed falcons roost in large numbers. They often select a large tree close to a source of light and pick off the many insects attracted to it. In Trafalgar Square, London, in the middle of one of the world's largest cities, pigeons outnumber people. These unfussy feeders survive easily on the many scraps of food. The many city window ledges and concrete structures provide ample nesting sites, perfect substitutes for the cliff ledges that are their natural nesting places. 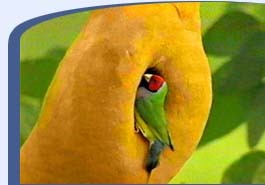 Birds also receive immeasurable assistance from the active caring of millions of people around the world. The food put out by ordinary homeowners benefits countless birds. Many Americans and Canadians feed hummingbirds. The profusion of artificial feeders seems to changing the migration paths of the some species. In Arizona thousands of hummingbirds come each day to one particular garden feeder. 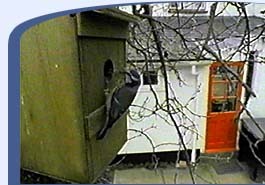 Many people put up gourds or more expensive bird houses for the purple martin. Now the bird prefers the articifial structures to its traditional home. There are many more examples throughout the world. In Britain the passion by householders for feeding birds in harsh weather is known to support a number of declining species. The main bird British body, the RSPB, has 1 million members. Promoting alternative methods of food production and income for local people in underdeveloped countries is crucial to successfully protecting wild birds' habitats; this is the approach that is increasingly being taken by conservation projects around the world. Local people are being encouraged to look on birds and other wild creatures as economic assets, for example making their area more attractive to tourists. In a Cameroon village, elders struck a deal with western conservationists to save the forest containing their scred bird, the Bannerman's turaco. Near Melbourne in Australia tourists pay big money to watch the nightly parade of the little penguins, and fund their conservation. There are many examples of committed conservation projects which have saved birds otherwise doomed to extinction. Schemes to rescue the Gurney's pitta, the western tragopan and Bannermann's turaco are just a few of the many integrated conservation projects currently underway. 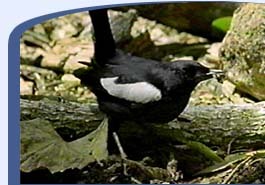 The programme to save the black robin on the Chatham Islands off the coast of New Zealand in 1976 is one of most famous conservation success stories of all. There were just seven birds left on all the islands, and only one was a female. Scientists removed the female's eggs as soon as they were laid, so inducing her to lay more than one clutch per season. The eggs were placed into the tiny nests of surrogate parents (warblers and tomtits). The robins were then raised as the tomtits' own chicks and fed up to, and past, fledging. Today there are more than 200 pairs of robins on the Chatham Islands. The idea of using surrogate parents to incubate eggs has been widely copied. 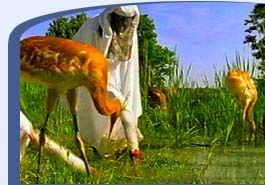 In North America a remarkable breeding programme has brought the whooping crane back from the brink of extinction, from just 16 pairs to over 300. They are fed with a crane-shaped glove puppet to stop them becoming humanised. But it's not enough to raise the cranes by hand. Somehow they must find the way to their traditional wintering grounds. Idaho farmer and whooping crane breeder Kent Clegg knows what to do. When the time is right, he leads them south to New Mexico. Behind his microlight. So where are birds going? More extinctions are certain, as man drives on to conquer the remotest parts of the globe, and populations grow and climate continues to change. 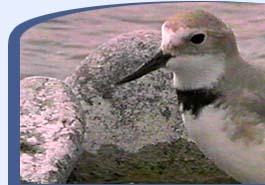 But other species birds will return to old habitats, often with man's help. One remarkable example is the red kite, a bird wiped out by Victorian hunters in England, and now thriving in a heavily populated area just 20 miles north of London where several pairs were reintroduced in the early 1990s. They fend for themselves, feeding on a ready supply of small mammals killed on the road. And the shape of birds to come? That can only be guessed at, as birds continue to adapt to habitats and changing conditions. One thing is certain. Such a versatile creature will always be with us, and with our distant descendants.